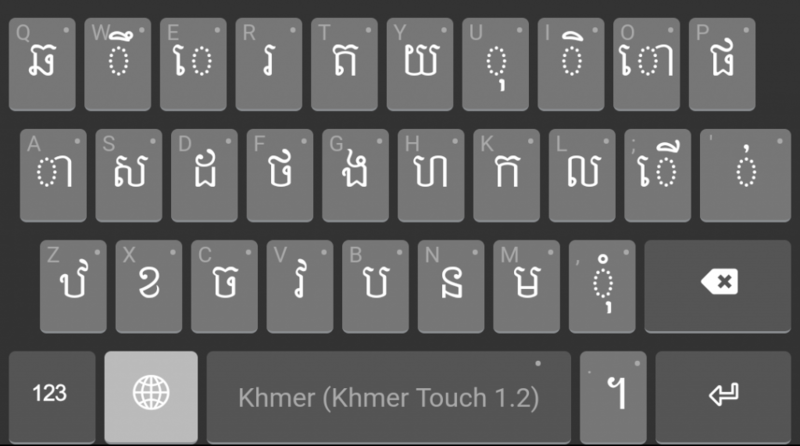 While other Khmer keyboards exist for iOS and Android, I wanted to try playing with one myself, given I am currently learning Khmer. Creating a keyboard layout is a great way to rapidly become very familiar with a script! 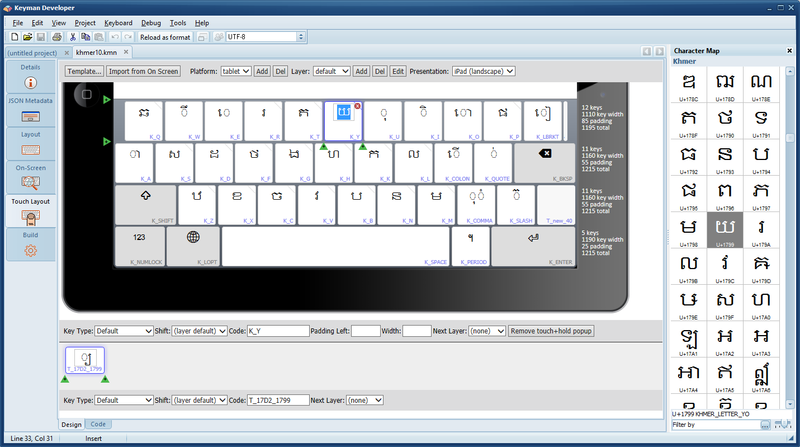 Keyman Developer makes it easy to play around with the layout of a keyboard and rapidly iterate the design. I was able to turn the original desktop layout into a mobile-optimised layout in under two hours, using only the visual editor. The base keyboard comes from the khmer10 Keyman keyboard created by Andrew Cunningham, which is based on the NiDA Khmer keyboard layout. This is a desktop keyboard, which follows a phonetic-style input, with letters placed as far as possible on keys with a similar sound in the English alphabet. 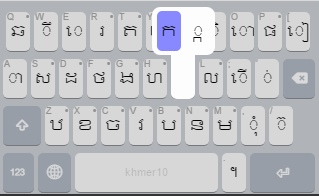 For example, ក is on the [k] key. I had a number of goals I wanted to achieve with this keyboard. I wanted the design to help me remember the script, the sounds and related letters. This may not be optimal for a person fluent in the language, but for me, the NiDA layout’s phonetic-style layout was a good starting point. As the original design is for a desktop keyboard, there are too many keys to fit on a normal mobile layout. As a mobile keyboard should ideally have no more than ten keys in a row, I started with reducing that as one goal. I tried to avoid moving keys around on the keyboard, or removing keys other than the ones described below. This way, once I do become familiar with the mobile layout, it is not a difficult transition to using the NiDA layout on a desktop computer. A number of non-alphabetic symbols are placed in a seemingly haphazard fashion on both the unshifted and Shift layers. The position of these symbols is probably pragmatic – the keys were available and not used for any other purpose. On a touch layout, we don’t need to maintain this because we can have as many or as few keys as we wish. I moved all non-alphabetic symbols and numbers to a numeric/symbol layer. The original keyboard uses the key [j] as a prefix to create a sub consonant, by emitting the Unicode U+17D2 sub consonant marker character. This is a little obscure, and meant that the shapes of sub consonants were never visible on the keyboard. I wanted to hide this encoding-based knowledge. I have added the sub consonants to the keyboard under a longpress menu for each base consonant, and added a rule to delete both the consonant and the prefix U+17D2 marker together when backspace is pressed. Thus, the average keyboard user need never know about the existence of U+17D2. As these are less frequently typed than the dependent vowels, they really didn’t need their own key on the keyboard. Again, from a language learner point of view, placing the independent vowels under the related dependent vowel symbol, as longpress menus, helps me to learn the shapes more rapidly. It also means that I don’t confuse the independent vowel shapes with similarly shaped consonants on the layout. The Khmer digits were already on the keyboard, but the Hindu-Arabic numerals were not. I added these as long-press under the Khmer digit keys on the numeric/symbol layer. This keyboard is nowhere near finished, but it’s now at a good point to start using it, before making further optimisations. After using it for a while, I will have a clearer understanding of what is uncomfortable or awkward to use, and will also probably have better ideas of how to resolve the issues. Still too many keys per row: some rows have 12 keys. I should try to reduce this to 10 keys. There are vowel combinations that may or may not be necessary. These do not render correctly on most operating systems on the keyboard, but do when used in writing. The backspace key should be either on the top row, or on the third row. It’s only on the second row at present because that was where there was space! The keyboard is missing a number of symbols that I probably won’t be using for now, but should be available for a complete solution, such as the Lek Attak numeric divination symbols. Some archaic letters are also not yet present. 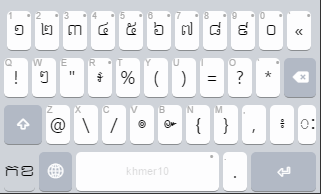 The Khmer OS fonts do not use the dotted circle for isolated diacritics, which makes them hard to read on the keyboard. The layers are not precisely the same width, which leads to slightly disconcerting movement on layer switches. The shift key on the shift layer is missing its icon. I just realised the independent vowels are currently missing – I need to re-add those soon! iOS has rendering bugs with Khmer, for example ខ្ញុំ on iOS overlaps the two subscript marks. On Android, there are different rendering issues, for example the font is too large for the keys by default (showing the original keyboard as I don’t have an Android device handy for an up-to-date screenshot). 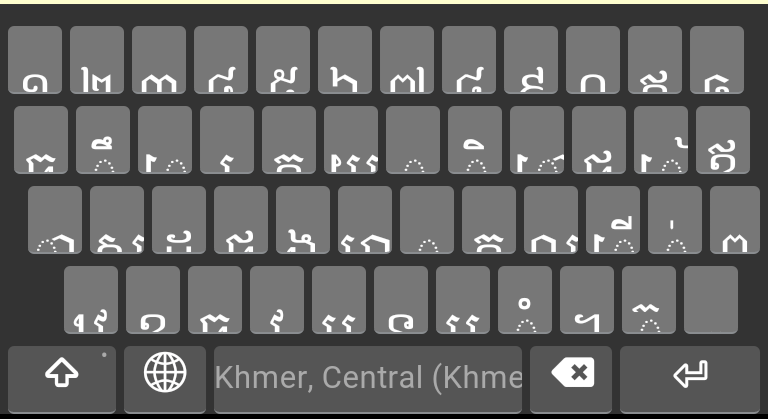 Despite these limitations, the keyboard should be usable for typing most Khmer text today, as least on iOS. It certainly covers most of my needs as a language learner today. As such, I’ve made it available for install into Keyman for iPhone and iPad or Keyman for Android. First, install the app from the appropriate link above. Then click the link below to add the keyboard to your device. I haven’t included a font in the keyboard, so you’ll need a device which already supports rendering the script. I welcome any feedback, of course! The source of the keyboard is available on GitHub at https://github.com/mcdurdin/experimental-keyboards.